In 2009, FAWCO and The FAWCO Foundation announced a four year program to bring a critical global issue to the attention of FAWCO Clubs, their members and the world. The FAWCO Target Water Program was an opportunity for FAWCO member clubs and FAUSA members to work together towards the goal of clean water worldwide. The 2009-2013 Target Program was focused on the global environmental issues of Water and Sustainability. In addition to raising awareness about the importance of clean water in all the countries where we are represented, we asked our member clubs to fundraise specifically for Tabitha Wells for Clean Water, Cambodia. FAWCO is an international NGO and the Target Program distinguishes FAWCO clubs from other international clubs by giving them the opportunity to pool their efforts and contribute together to a UN Millennium Development Goal. We asked our member clubs for their support in whatever ways were open to them. Together we have made a huge impact on access to clean water worldwide. FAWCO's Target Water Program, which ended in February 2013, was a tremendous success with participation from 78% of member clubs and nearly $165,000 raised. 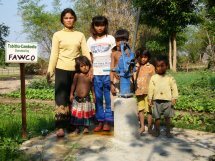 About $135,000 went to Tabitha Cambodia Wells for Clean Water while the remainder went to other Water projects. At the 41st Biennial conference in Bern, Target Program Chair Anne van Oorschot (AWC The Hague) received a Caroline Curtis Brown Spirit Award for her tireless work in the last two years. She gave an excellent final report and included a thank-you video from Tabitha's founder Janne Ritskes. 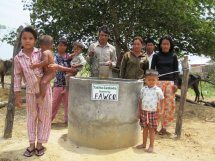 Thanks to the generosity of our clubs and members, FAWCO has changed the flow for 1541 families in Cambodia. In September 2012, the FAWCO Board appointed the Target Evaluation Team to review the Target Water Program and make recommendations for improvements. Thanks to Monica Jubayli, Anne van Oorschot, Elsie Bose, Sara von Moos, Karen Lewis, Pam Perraud, and Tricia Saur for their thorough evaluation and thoughtful recommendations, which have been adopted by both FAWCO and The FAWCO Foundation Boards. Download the Target Program Final Presentation. Download PICTURES of FAWCO wells . Check out our fundraising ideas. Go to The FAWCO Foundation website for more fundraising ideas and stories from Cambodia. FAWCO met $80,000 goal in first year of Target Fundraising!